The HD Leaders News and Information Site. CALL 509-486-4137 – For more Information about our Products and Services. Were the Future of C Band TV. Pay for our products over time. We are proud to announce that Rainier Satellite now stocks two PLL LNB’s, Chaparral Ortho Feeds, and both Professional and Basic Core Electronic packages. You can order Now – Products in Stock! Its time to dump that old clunky 4DTV, analog satellite receiver or messy problematic dish mover. HOW? Upgrade to one of the Core Electronics packages available from Rainier Satellite. Simplify your experience with our D9865 receivers. No 4DTV old style outdated maps to play with. No incompatible DISEqC commands to setup from messy software dish movers. 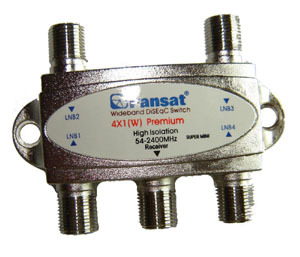 Advantages: High Stability Norsat PLL LNB’s grabs the signal and keeps it locked in. 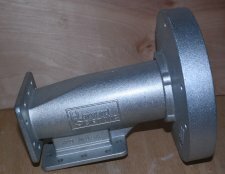 Chaparral ortho feedhorn. time tested quality design. No more servo motors to freeze or burn out. Simple setup and control Pansat AP-600 mover moves your dish in all weather with pinpoint accuracy without over or underun. Large 4 segment LED display shows at a glance which satellite your dish is on. (no need to get out the glasses to read some tiny LCD washed out backlit display) High isolation approved switch with 4 input ports allow full voltage H/V c and ku band switching for maximum stability right from the D9865 receiver. All the guesswork was taken out of what to get with Rainier’s we test it thoroughly before we sell a product testers group. Our system is guaranteed to work out of the box without headaches before release. Upgrade today with our Professional or Basic Core Electronic package. Simplify your C band experience as Rainier marches C band Satellite well into the future. Rainier Webstore Now Selling most products for your C band Install needs. 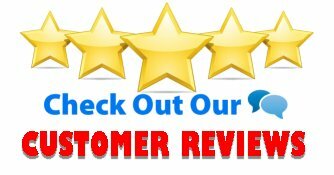 Contact Rainier’s Customer Support about products not seen on our Webstore. Rainier wants to simplify your shopping experience by providing you a one stop shop for all your needs. Posted on September 25, 2015 September 25, 2015 Author rainiergroupCategories Rainier NewsLeave a comment on Rainier Webstore Now Selling most products for your C band Install needs. 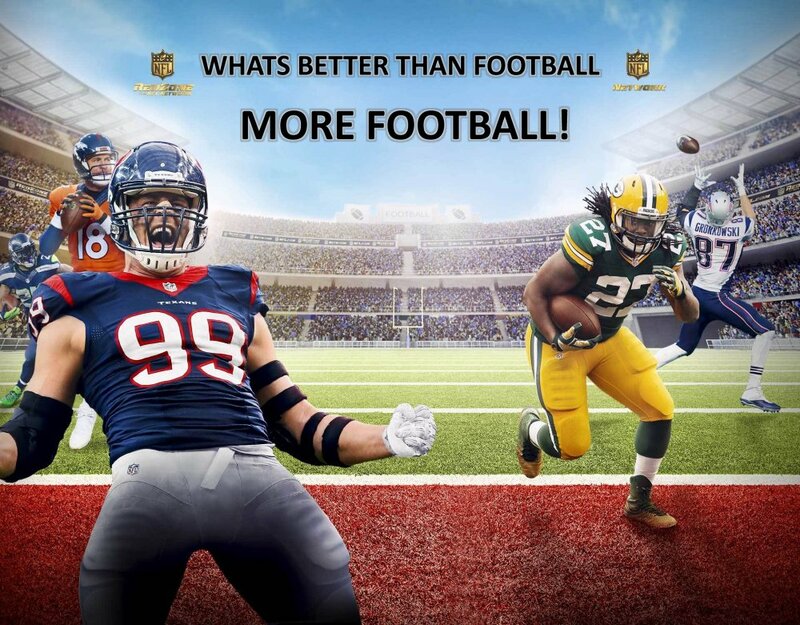 Posted on September 24, 2015 Author rainiergroupCategories Rainier NewsLeave a comment on Whats Better Than Football? A letter from Rainier Satellites President. I personally want to take this time to thank all who have become part of the Rainier Satellite subscription TV family. Our latest figures show subscriber count continues to grow. Also our various webstore product sales are seeing exciting expansion in sales too. This is great news for those who love their C band television. With this continued growth Rainier can keep investing in expanding and adding products and services for you the backyard dish owner. We will be releasing two versions of our core electronics package in the very near future. A lower cost basic package, and high end professional package (for those who demand the best). They will both include quality Norsat PLL LNB’s, a Chaparral dual feedhorn, and switch needed to control the polarity to the D9865 series receivers. To complete the package it adds the world class Pansat AP-600 mover to move your dish for use with our D9865 receiver for the complete full arc Rainier Satellite updated C band experience. Rainier also continues to make progress with our new CAS+Plus platform. which will transform the C band industry. With 16 current and growing number of contracts with various programmers for their channels. The CAS +Plus system can easily yield 100 or more channels coming to this exciting platform. to see whats new and exciting happening with C band television. 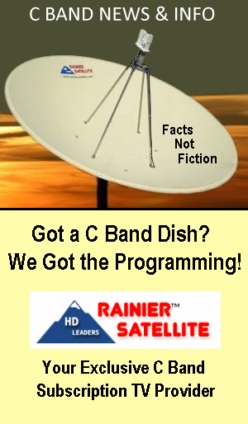 We hope many C band enthusiasts who stop by will soon become members of the Rainier Satellite TV Family as the expansive C band growth continues. 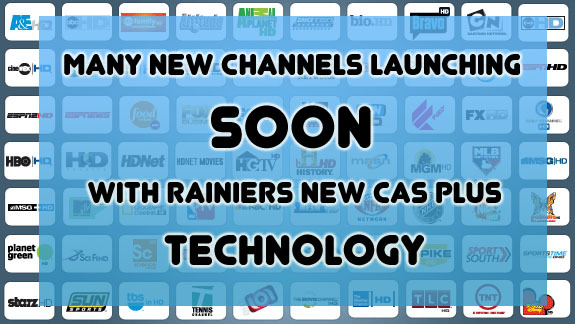 Rainier Satellite is proud to announce a new CAS Plus system will be rolled out on many current & future channels being added on Rainier Satellites C band satellite platform. With the new CAS Plus system deployed the C band signals the programmers and Rainier use will be secure from breaches in conditional access security that may be found on other older style conditional access systems. Many industry leading big name programmers are being added to the new system as of writing this. The new CAS Plus system being unique in the way it works also protects and renders older system breaches unusable by those trying to use them. CAS Plus is based on the latest state of the art technology to date. Rainier is proud to be at the forefront of this project and implementation on signals has begun. What this means for the programmers and consumer are signals will be fully secure, and allows access to 100’s of channels Rainier is acquiring for its C band Pure HD satellite platform. BACK TO FOOTBALL SALE ON NOW! Its officially Kickoff to Super Bowl 50 time! 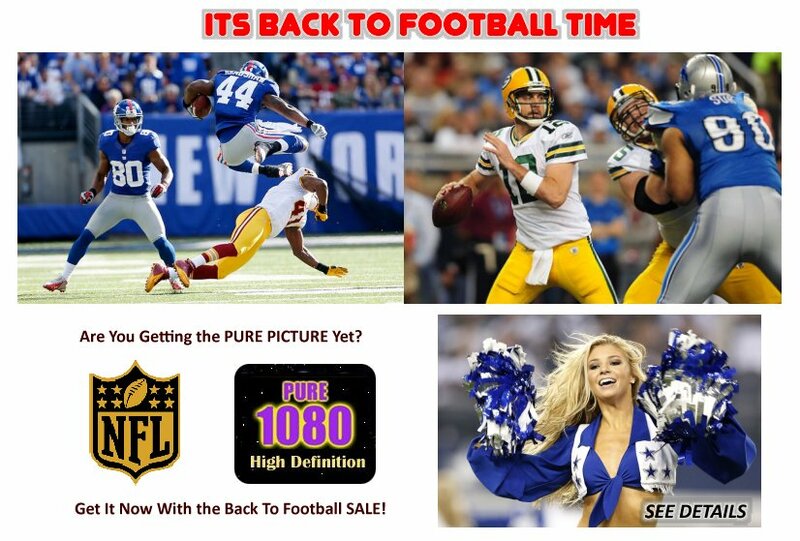 What a great time to get the Pure NFL Action Only from Rainier Satellite! Now Until September 24th 5PM EST you can get our highly acclaimed D9865H HD receiver at our Low Sale Price. There are no more Excuses Order TODAY! Posted on September 10, 2015 September 10, 2015 Author rainiergroupCategories Rainier NewsLeave a comment on BACK TO FOOTBALL SALE ON NOW! If you are a C band dealer or home entertainment provider wishing to expand your business into the exciting future of HD and 4K you can easily become a dealer for Rainier Satellites expanding network of dealers by downloading and returning our dealer application form. Once approved you will be able to resell Rainier products and services to your clients. Rainier will provide your business information free of charge to our clients and basic association advertisement on our website of approved dealers. Professional business advertising is also available (contact corporate@rainiersatellite.net) for our pro package. Get into the future of HD and 4K entertainment today. Got TI? Get it out with this. Hard to find – not anymore. We have them. 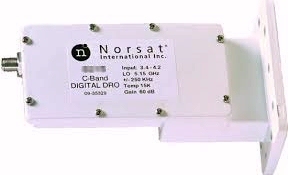 Norsat TI Fighter DRO commercial grade LNB gets the TI out. This hard to get LNB assists in eliminating terrestrial interference from radar and other microwave sources by operating above the offending frequency range of 3.7GHz. +/-250k stability. 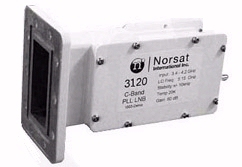 Noise Temperature: 25 K.
Norsat LNBs are graded by Stability and Noise Temperature to provide the perfect balance between required performance and cost Proven reliability for lower lifetime costs. DRO 250k stability to control receiver drift and employ lower bit rates. Excellent Phase Noise to Lower Carrier to Noise margins, improving BER.